Disclosure: I received sample products to facilitate this review. No other compensation was received and all views expressed are my own. I love personalized things, but my kids have fairly unique names. It's not always easy to find a pre-made item featuring their names. That means, when I'm seeking something personalized, I usually either make it myself or turn to small businesses who specialize in the design of unique, personalized gifts! 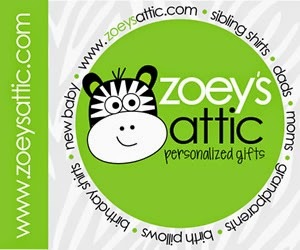 One of my favorite companies is Zoey's Attic and I'm excited to share this wonderful shop with you today. 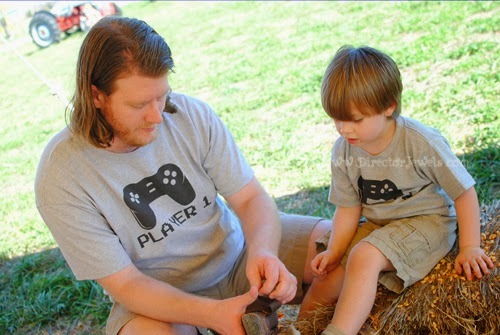 We were sent a set of Matching Video Game shirts for Andrew and Lincoln to wear - and I think they're so fun! Lincoln is obsessed right now with playing video games with Daddy. 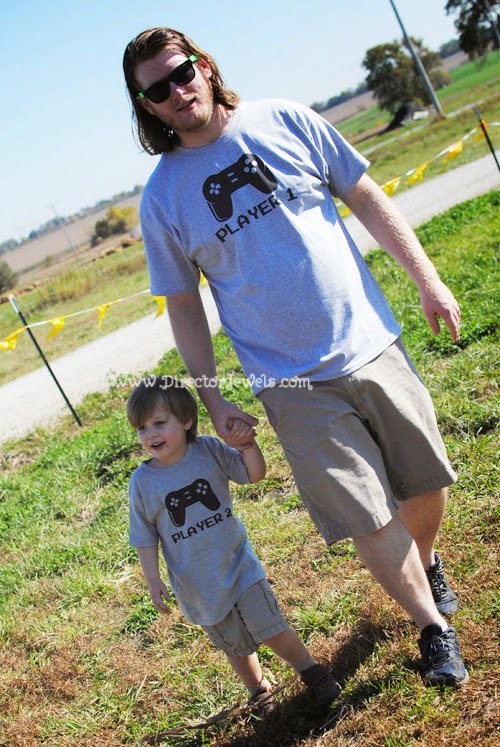 He is a big fan of Super Mario Bros. and The Legend of Zelda (maybe because those are Daddy's favorite games, too?) and on the weekends, I will frequently find them curled up fighting bad guys together. I thought this shirt set would be a good fit and Lincoln was so excited to have a shirt that matched his daddy's! Erin Delanty, the owner of Zoey's Attic, was inspired to open her business after the birth of her daughter in 2006. 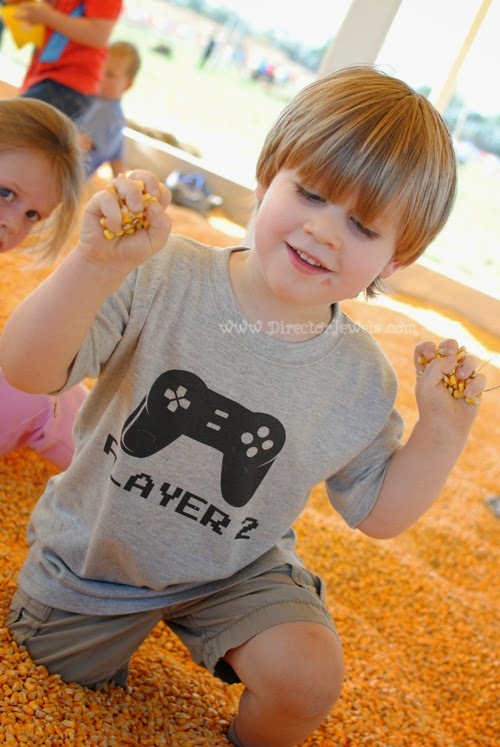 In addition to this awesome geek shirt pair, she offers a wide variety of unique birthday shirts (like Lincoln's 3rd Birthday firetruck shirt), Big Brother/Big Sister shirts, Sibling shirts, Maternity shirts, Holiday shirts, personalized pillows, and so much more! The selection is amazing - I think there is something to fit any occasion or theme! Zoey's Attic is my go-to for personalized birthday shirts and I've had my eye on some custom pillowcases for Lincoln and Addie for ages! If you're looking for a unique way to announce a new baby at family holiday gatherings this year, there are some super cute pregnancy announcement shirt options! Visit Zoey's Attic to You can also follow along on Facebook, Twitter, and Pinterest for all the latest updates. 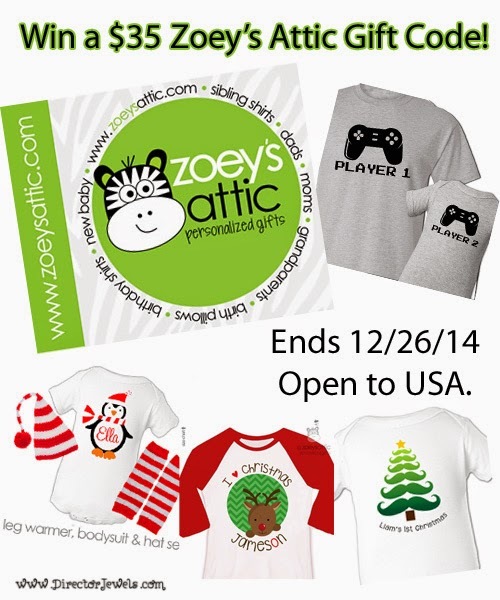 One Director Jewels reader will win a $35 Gift Code to Zoey's Attic! This giveaway will end on December 26 at 11:59pm CST. This giveaway is open to US readers only. Winner will be emailed and will have 48 hours to respond or prize will be forfeited. Disclosure: Thank you to Zoey's Attic for providing my review sample and the giveaway prize! I received no other compensation and all views expressed are my own. For more information, you can read my Giveaway Policy and my Disclosure Policy. Lmbo! This site is great. I like the keep calm and drink a margaritas t shirt for her. I love the personalized aprons! My grandbaby loves penguins...that tee would be sweet. I love the girl reindeer bodysuit with leg warmers. My daughter would look so cute in that. I might get the Monogrammed mason jar tumbler turquoise striped personalized acrylic tumbler -( BPA free) for my daughter. I really like the Football First Birthday shirt he would look very cute in it! I might choose the Gingerbread Girl Birthday Shirt if I won. I love the Dad and baby set that says "I make adorable babies" and "adorable baby." Also the sibling sets are amazing! First birthday shirt boy or girl caterpillar personalized bodysuit or Tshirt and bib matching set! I love it for my daughter, and we love Eric Carle. Thank you! I'd probably go for a big/little brother set! I would definitely get the Crazy Cat Lady tee! That's absolutely perfect! Great shop! I think I would choose the Building Blocks Birthday Shirt! The Big brother or little brother shirt matching skull and cross bones Tshirt looks cute! I love the papa bear and baby bear matching shirts! I would get the black Moms get promoted to Grandmas tee shirt. I would love to get the butterfly birth announcement pillow! I LOVE their Monster Tooth-fairy Pillows!!! I love the cooking with wine apron and ballerina personalized pillowcases! I would love to get the I MAKE AWESOME KIDS DAD AND AWESOME KIDS MATCHING T-SHIRTS CUSTOM GIFT SET OF THREE DARK SHIRTS for my grandkids and their dad. The Jingle Belly shirt is sooo cute! I would love to get my daughter an embroidered shirt with her name on it. I like the Super Dad shirt.